In 1984 whale researcher Katy Payne spent a week with eleven elephants at the Washington Park Zoo in Portland, Oregon, 170 miles south from my Pacific Northwest home. An acoustic biologist with fifteen years of experience studying the long and complex calls of whales, she was curious as to the kinds of sounds elephants make. Every waking hour of that week she listened and watched the elephants’ behavior at the zoo. She noticed that certain keepers elicited a positive response from the elephants, an intangible “thrill” in the air, like the rolling vibrations of thunder right before you hear them. On her way back to Cornell University, while she thought about her observations, the throbbing of the airplane reminded her of a pipe organ she once heard. During a performance of Bach’s Passion According to St. Matthew, a shuddering filled the air as bass notes from the great pipes descended in a deep scale until sound disappeared – but the air still throbbed. Those same, strong, vibrations-without-sound had filled the air around the elephants in Oregon. Could they be communicating with infrasound, like whales? Four months later, back at the zoo, Payne and fellow researcher Bill Langbauer set their recording equipment to its slowest speed. They mapped the elephants’ movements and timed changes in their behavior with the recordings. Working around the clock for an entire month, they recorded what sounded like snores, chirps, barks, rumbles and even moments of absolute silence. Back at Cornell, the first tape Payne selected to review was during a time of silence, when there was a “thrill” in the air as a female elephant faced a concrete wall and a male elephant faced the same wall in an adjoining enclosure. The elephants were just three feet apart, but completely separated. Running the tape at ten times its normal speed, the researchers heard sounds emerge from silence – elephants carrying on an extensive conversation in infrasound, even when they couldn’t see each other. To test this new theory of elephant communication, The Cornell research team rigged a double-blind experiment in Africa. An observation tower near a waterhole at Etosha National Park in Namibia was outfitted with video cameras and microphones. Miles from the waterhole, a mobile van roamed through the bush outfitted with broadcast speakers and tape recordings. The timing, location and content of the broadcasts were unknown to the observers at the tower. One hot, dry afternoon, two male elephants, Mohammed and Hannibal, picked their way through the white calcareous rocks around the waterhole and paused for a drink. As soon as the two bulls arrived, the tower radioed the van. 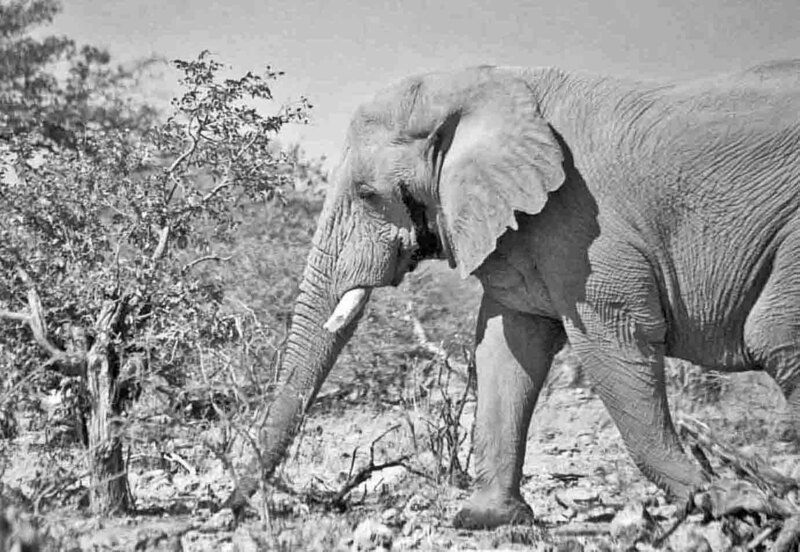 Selected at random, infrasonic estrous calls of a female elephant from Kenya were broadcast to the two bachelors in Namibia. A female elephant needs to advertise as far and as wide as she can, since she is receptive to males for just a few days every estrus cycle. She repeats her calls over and over for up to forty-five minutes at a time. The calls can be heard for nineteen square miles – but only by other elephants. Just seconds after the sound was sent, Mohammed and Hannibal froze, spread their ears and lifted their heads – twisting them side-to-side like scanning radar. Within two minutes the bulls set off. Half an hour later the pair strode past the van, looking for love in all the wrong places. This is truly fascinating information. Would love to hear and interpret those sounds of communication between these magnificent animals. Wouldn’t we all….Thanks for your comments. Fascinated by the audio/communications research … reminds me of the Yma Sumac essay that you were so kind to share with me and our Hummingbird Review readers. Thanks, Charles. Stay tuned – Yma Sumac is Part Two! the wisdom of the animals!